Best described as what would happen if a physics puzzle and a zombie platform shooter were thrown in a blender, Ant Karlov's Zombotron has arrived. Is it glorious? Just a bit. You play a lone mechanical warrior on a planet apparently overrun by all manner of surly undead, and you're not just going to stand idly by while they wander around with buckets on their heads, blowing things up willy-nilly! (Admittedly, not their fault; kind of hard to see where you're going without a head.) Just be careful, since the place is literally falling apart around you, and some irresponsible jerk has gone and left a bunch of explosive canisters next to all the crumbling woodwork!... hmm... wonder if you could use that to your advantage? Use [WASD] to move and jump around, and the mouse to aim and shoot. Your weapon and ammo are kept track of on the upper left of the screen, and your health is on the upper left; make your way to the end of each stage, gathering coins to purchase upgrades, and try not to get wiped out by the remarkably persistent monsters. (You wouldn't think mechanical warriors were even that tasty, but I guess zombies don't discriminate.) Fortunately for you, even if you run out of ammo, if you're resourceful you can usually find a way to kill your foes just by manipulating the environment; push barrels or rocks onto clueless enemies, knock down structures, bring elevators down on zombie heads, and more. Each level also introduces new baddies, like killer robots, relentless machine gun turrets, skeleton warriors, and more. Basically, it's like every piece of Evil Dead fan-fiction I ever wrote, despite a disappointing lack of Bruce Campbell's magnificent, chiseled jaw. Analysis: There are a lot of zombie shooters out there, so it helps that Zombotron comes with a gleefully destructive environment and ragdoll physics, which makes it stand out from the pack surprisingly well. It doesn't hurt matters that the visuals are actually quite lovely in a dreamy, otherworldly environment sort of way, which isn't typically a compliment I get to play to a game that prominently features headless bombers and hatchet-wielding robots. It's a strange bit of criticism, but part of the enjoyment of most zombie games is the cathartic potential of charging in guns-a-blazin' while going "ARRRR", and Zombotron doesn't really pull that off. It's like sight-seeing in a beautiful, highly flammable and poorly constructed location with heavy weaponry. Actually, scratch that "poorly constructed bit", since a big part of what makes Zombotron cool is making use of the carefully placed physics devices throughout each level, where a single shot can set off a satisfyingly explosive chain of events at just the right time. On the downside of things, the actual shooting and platforming don't feel quite as responsive as you might hope them to be, mainly because a vaguely sluggish feel to the controls makes it seem like you're operating underwater. The fact that your shots are also all over the place to a certain degree, no matter how steady your cursor is, makes picking off monsters on the other side of obstacles annoying. Enemies also just aren't that smart, which is admittedly understandable if you're talking about someone whose brain is a pile of gray mush (or who has no brain at all), but it's still somewhat disappointing to know you can deal with even the largest zombie horde simply by standing on the other side of a pit and watching them drop off as they try to reach you. It's like if Wile E Coyote wanted to eat your brains; maybe the sequel will have you painting a tunnel on a brick wall with some ACME paint. 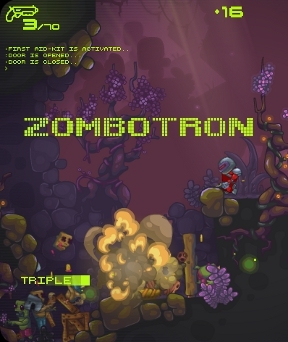 But even with its problems, Zombotron is still a welcome respite from the tide of samey, gorey zombie shooters, and brings a much needed touch of creativity to the genre. The levels are nice and big, with a great sense of exploration lent to the way you find your way around that almost gives the game a bit of a Metroidvania feel. The additional "missions" for each level (finish in less than three minutes, with less than sixty shots fired, and so forth) will provide a nice challenge for some, but even if all you want is just some get-down, monster-thrashin' action, Zombotron is worth checking out. Besides, you want to be ready for anything when the world goes all apocalyptic and junk, don't you? This way when the whatever hits the fan and the zombies, skeletons, and robots start coming for you, you'll be all, "Pssshh! Come at me, bro!" and the sane folks can all get away while the monsters are distracted with your tender flesh. I cannot look at this game without thinking "Welcome to Zombotron...you can do anything in Zombotron...."
All I think of when reading the title is ZOMBO COM. I am so relieved that I wasn't alone in thinking this. I thought of ZOMBO COM too. The interwebs are such a small place, aren't they? Not just a small world wide web - but I think we're all dating ourselves. Zombo.com came out in 1999! Yep, I'm right there with you all. Making bad guys run into brick walls with ACME paint sounds like such an amazing game. 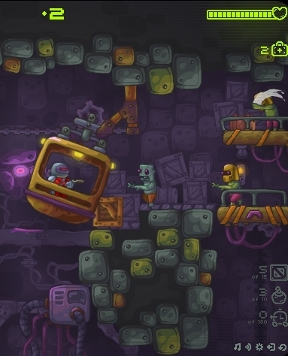 You can do anything at Zombotron. Haha, thought the same upon seeing this game's title. Nice game, bit disappointed that I can only hold one weapon besides the pistol. Otherwise its great fun. You probably didn't notice that you could switch to a pistol THEN swap guns? Hmm. It nags me having to admit that I like a "running around and shooting things"-game... Probably because of the scavenging. VERY very fun but a little easy and kind of short. I am quite excited for the "to be continued" next installment. If anything I would like to see a larger game window so that we can see/shoot farther. Right now the guns function relatively similarly because everything's basically point blank anyway. A further field of view would give a much different feel to a heavy grenade arc vs an accurate sniper rifle (gains damage on longer distances?). The artwork reminded me of this game about mining, and hey-o, 'tis made by the same guy (made Mining Truck 1 & 2). Looks like people prefer zombies over mining. I can understand this. Really appreciate how much went into the artwork; everything looks collective and whole. "It's like if Wile E. Coyote wanted to eat your brains...."